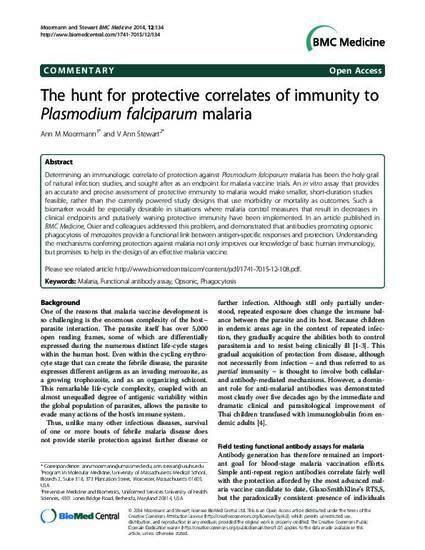 Determining an immunologic correlate of protection against Plasmodium falciparum malaria has been the holy grail of natural infection studies, and sought after as an endpoint for malaria vaccine trials. An in vitro assay that provides an accurate and precise assessment of protective immunity to malaria would make smaller, short-duration studies feasible, rather than the currently powered study designs that use morbidity or mortality as outcomes. Such a biomarker would be especially desirable in situations where malaria control measures that result in decreases in clinical endpoints and putatively waning protective immunity have been implemented. In an article published in BMC Medicine, Osier and colleagues addressed this problem, and demonstrated that antibodies promoting opsonic phagocytosis of merozoites provide a functional link between antigen-specific responses and protection. Understanding the mechanisms conferring protection against malaria not only improves our knowledge of basic human immunology, but promises to help in the design of an effective malaria vaccine.